Trumbull resident Deborah Vadas Levison has written and published a book that shares two important, overlapping stories. The Crate: A Story of War, a Murder, and Justice is also a love story to the cottage built by the author's parents, and the memories now reaching into the third generation of that family. Ms Levison's next public program is scheduled for Sunday, April 29, at Congregation Adath Israel. The Crate, Deborah Vadas Levison's first book, will be followed by a second already well underway. Without giving too much away, the author did tell The Newtown Bee recently that she is working on a fictionalized account of events that took place in Connecticut during the 1980s. The next book will also have overlapping past and present stories, which Levison did well with in her debut release. Local residents probably recall the story of John Heath, a Newtown resident who nine years ago was charged and then found guilty of killing his wife. It was the April 2010 discovery of Elizabeth Heath’s skeletal remains, found in a dry well in the couple’s former home on Poverty Hollow Road, that reopened that case and eventually led to the conviction of Mrs Heath’s murderer. While that ugly chapter was playing out, in July 2010 a family in Canada was rocked by an equally gruesome discovery. It is not giving anything away to say that the body of a woman was found in a crate that had been nailed shut and carefully hidden in the crawl space beneath the a family’s beloved summer cottage in Muskoka. This time, however, the homicide victim had nothing to do with the homeowners. The discovery of that crate led to the reopening of wounds from which Holocaust survivors Pista and Vera Vadas had successfully protected themselves for decades. It led to closure for the family of a woman, Samantha Collins, who had not been heard from for nearly 3½ years. It also led to the creation of the first book by Deborah Vadas Levison, an award-winning journalist and the daughter of Pista and Vera. 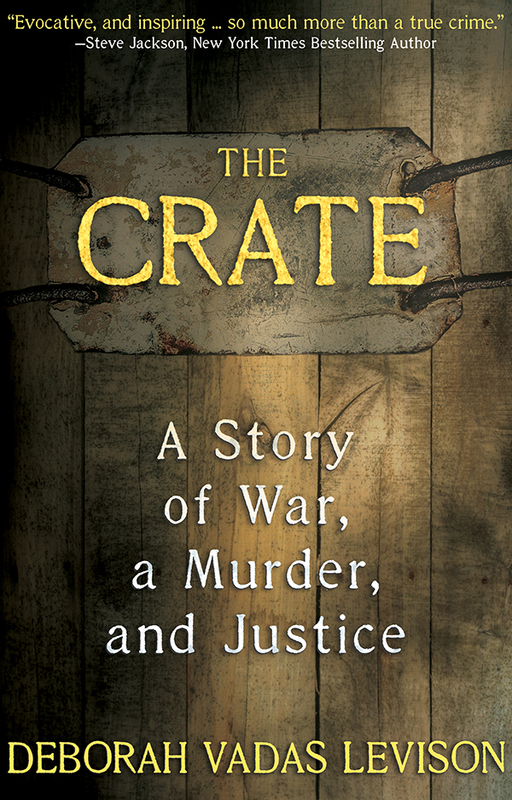 Ms Levison wrote The Crate: A Story of War, A Murder, and Justice, which was published in June by WildBlue Press. Ms Levison is scheduled to speak at Congregation Adath Israel, 115 Huntingtown Road, on Sunday, April 28, at 2 pm. A book signing and then refreshments donated by Sugar Magnolia Bakeshop of Newtown will follow the author’s presentation. “After all was resolved,” Ms Levison, who lives in Trumbull, told The Newtown Bee recently, “I had an idea. Here was this woman who lost her voice. She did not come from a family of means, and her story might not be heard otherwise. Once an outline was complete, Ms Levison crafted a book that overlaps all three areas of focus. The true crime book offers the riveting story of her Hungarian parents’s incredible survival through ghettos, death marches, and concentration camps during World War II. Their story is interspersed with the story of homicide victim Samantha Collins and the investigation that first looked at Ms Levison’s brother — who reported the crate’s discovery to the Ontario Provincial Police — before widening its scope to find Ms Collins’s true killer. The Crate is also a love story to the cottage built in the early 1970s that has brought joy — for the most part — to three generations of the Vadas family. The stories are shared in flashbacks, as remembered conversations between the author and each of her parents at different times in her life. Those are among the most difficult sections of the book to read. Each parent shares their story, and they are heartbreaking. Readers should plan to take a break from the book after reading those chapters. They are that difficult to read, but they are important. Even Ms Levison had a hard time hearing the stories of her parents, Hungarian Jews who each spent time in concentration camps before meeting after the end of the war. But she also felt an acute awareness of how important it is to share those stories with the world. It was very difficult, she said, to face “how much pain they had to go through. The family immigrated to Canada in 1956. At that time, Pista and Vera emigrated from Hungary “with the entirety of their valuables: their three-year-old son, Peter, and my Dad’s leather jacket,” wrote Ms Levison, who was born 11 years after the move. Years later, the Vadases built a summer cottage in Canada’s Muskoka region, approximately two hours north of Toronto. The chalet-style lake house, which the author describes as “a pre-manufactured design from Pacific Prefabricated Homes,” may have started its life as a cut-and-paste creation, but the author’s parents did everything possible to create a safe, entirely happy haven within its walls and under its roof. Summers trips to the cottage were highlights of Ms Levison’s life. “The cottage. Those two words evoked such a powerful blast of sensory memories: Silky lake water encapsulating me like a womb,” she wrote in an early passage. “Dappled sunshine warming me through a canopy of green leaves as I lay on the dock. Fires in the woodstove on a chilly morning, stoked with kindling I had chopped by myself with my little yellow hatchet. The sweet smell of my mom’s plum dumplings sprinkled with cinnamon and icing sugar, the chug-chug of motors, classical music from an album spinning on the turntable. My bare feet on cool linoleum and warm earth. “Nothing characterized my childhood more than the summers spent at our cottage,” she wrote, recalling those blissfully happy times immediately after being told by her brother of the grisly discovery made within that peaceful sanctuary. “I really tried to convey such a central role it played in our family,” Ms Levison said. After many years of peace, they were faced with a homicide in their own backyard, awaking painful memories of their past. It is not a beach book, nor a gentle summer read. It is a book to be read slowly, and gently digested. There is a lot of detail, all worth soaking up. Ms Levison’s author website (debbielevison.com) serves as an expanded version of the story, filled with a photo gallery and an entire section devoted to The Crate. Under a tab simply titled Book, visitors can read praise for the book and a glossary of Hungarian terms and recipes. There is also a Key to Settings, a map of the points around the world mentioned within the story. In addition, there is a page dedicated to The Spielberg Foundation, now The USC Shoah Foundation, and another page with suggested talking points for book clubs and discussion groups. Under a separate tab called Photo Gallery, visitors will find images of the cottage, family photos, photos taken in Hungary, photos of homicide victim Samantha Collins, and crime scene photos. Some of those photos and suggestions are built in to the growing number of public events Ms Levison has been doing. Her talks are tailored to each audience, she said recently. “They include some family context, and how the crime came about,” she said, “but it’s different for each group. Sometimes I talk about gun violence, sometimes it’s domestic violence. There is no charge for the public event at the synagogue. Reservations are not needed, but additional information is available by calling 203-426-5188. In addition to the Congregation Adath Israel event, Ms Levison has appearances scheduled through November. Visit her website for details.